1. NO ONE KNOWS EXACTLY WHERE, WHEN, OR HOW THEY WERE FOUND. They may have been unearthed from beneath 15 feet of sand at the head of Uig Bay. Or perhaps they were found in a sandbank by a dim-witted farmer who mistook them for elves and promptly fled, only returning to retrieve them at the urging of his braver wife. Or perhaps the survivors of a shipwreck buried treasure they salvaged from the wreck but never returned for it. Yet another theory places them in the ruins of the House of the Black Women, an abandoned nunnery. These various tales have one thing in common: they put the discovery of the chessmen in Uig. All we know for sure is that the chessmen had to have been found before April 11, 1831, when they were displayed in Edinburgh at the Society of Antiquaries for Scotland. 2. WE ALSO DON'T KNOW WHERE THEY WERE MADE OR BY WHOM, BUT SOME SUSPECT THE ARTISAN WAS A WOMAN. The most widely accepted theory puts their place of origin as Trondheim, Norway. Another has them carved at the see in Skaholt, Iceland, where, according to the Saga of Bishop Pall, Margret the Adroit, the high-status wife of a priest, “was the most skilled carver in all Iceland” and was regularly commissioned by the bishop Pall to craft walrus ivory gifts he sent to friends in high places overseas. In this theory, that could be how the chess pieces got to the Isle of Lewis, which was an important trading center at the time. Some archaeologists have floated the idea of excavating the see in Skalholt to look for Margret’s ivory workshop. 3. OTHERS SAY UP TO FIVE ARTISANS CARVED THE PIECES. 4. BASED ON THE ROOKS' WEAPONRY AND THE BISHOPS' MITERS, THEY WERE LIKELY CARVED BETWEEN 1150 AND 1200. There's no archaeological context for the pieces, so we can't date them precisely. But their duds give us reliable clues. The rooks are all warriors decked out in a fashion typical of the late-Norse period: long leather coats, kite-shaped Norman shields, expensive swords, and mostly pointy helmets (two look more like a bowler hat and a bucket, respectively). As for the bishops’ miters, or pointed hats—the way they’re peaked front and back identifies them as a style worn in the late 12th century. 5. FOUR OF THE ROOKS ARE BERSERKERS. 6. 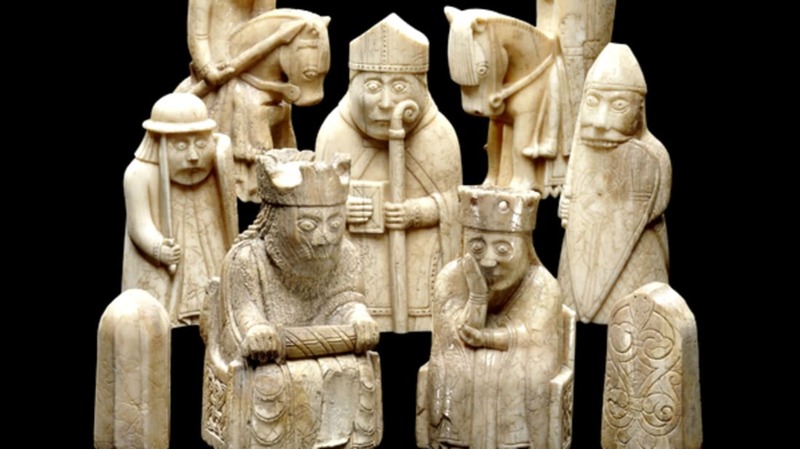 BISHOPS MAY HAVE MADE THEIR DEBUT ON THE BOARD WITH THE LEWIS CHESSMEN. 7. THE KNIGHTS' HORSES HAVE COMICALLY—BUT ACCURATELY—STUBBY LEGS. The tall steeds we picture knights in the Middle Ages mounted on weren't actually very common in the 12th century; from Italy to England, most people rode stocky breeds, with the rider's legs dangling well below the horse's belly. The Lewis knights' horses are no different. Even today, Icelandic horses, purebred since the 12th century—the time of the Lewis chessmen—are strong and agile, but they are also pony sized. Brown writes, "A popular cartoon, printed on postcards, shows an Icelandic rider wearing roller skates." 8. THE QUEENS ALL HOLD ONE HAND AGAINST A CHEEK—A GESTURE YET TO BE UNDERSTOOD. 9. WE MAY BE ABLE TO IDENTIFY TWO OF THE KINGS. Like the queens, the eight kings sit on thrones, and their faces are equally grim (except for the two young ones, who are a bit eager). They have swords across their laps and all but one sport long hair twisted into locks. If the pieces do indeed date to the late 12th century, we may be able to identify two of them: Magnus V, crowned in Norway in 1164, and Sverrir (1184–1202), who followed him. Magnus V—not to be confused with Magnus the Bare-Legs or Magnus the Blind—became king at just eight years old, but his father Erling Skew-Neck really ruled Norway until he died in 1179, by which time Magnus was a handsome man fond of drink and women. Sverrir, on the other hand, was stout and broad, and “looked most kingly when he was sitting down,” Brown writes. When Magnus died in 1184, Sverrir took the throne, but clashes with the archbishop led to his excommunication, and he soon had an armed rebellion on his hands. Eventually the rebels were trapped at Viken and reduced to eating their walrus-hide ropes, and Sverrir gave them quarter. A kind of peace ensued, but Sverrir died months later of illness, still excommunicated. The year was 1202. According to the Saga of King Sverrir, the king griped towards the end, “Being a king has brought me war and trouble and hard work." 10. HARRY AND RON PLAY WIZARD CHESS WITH THE LEWIS CHESSMEN IN HARRY POTTER AND THE SORCERER'S STONE. 11. AS SCOTLAND CONSIDERED INDEPENDENCE, THE LEWIS CHESSMEN WERE CONSIDERED A NATIONAL ASSET ALONGSIDE OIL AND THE MILITARY. There have been calls to “repatriate” the Lewis chessmen from the British Museum for several years. This push dovetailed with the movement towards Scottish independence in 2012, when the pro-independence, center-right Scottish Democratic Alliance party published a white paper titled “The Future Governance of Scotland” that included five key aspects of the “exit strategy from the U.K.” Number 3 on the list: “Negotiation on division of the U.K. assets (oil, financial, military, Lewis chessmen, etc. ).” In 2014 Scotland voted against independence. 12. SIX CHESSMEN WILL RETURN "HOME" NEXT YEAR TO A CASTLE ON THE ISLE OF LEWIS. The 19th-century Lewis Castle is slated to be the home of six chessmen on permanent loan from the British Museum. The castle was supposed to open to the public this month, but concerns about security measures and environmental conditions in the exhibition room at the castle have delayed their return until next year.